I’ve held my tongue about the AIG bonuses because I haven’t had the energy to take on the torch-and-pitchfork brigades. But although I can understand the populist anger, and maybe even share it a bit, the frenzied response has turned me off since the day the story broke. DeSantis didn’t create the credit default swaps crisis — he took a $1 salary to transfer in from another area of AIG to help fix the mess. In exchange for accepting that token salary, he was guaranteed a payout at a certain level if the company survived long enough to pay it. This wasn’t a “bonus” in any meaningful sense of the word. It was a deferred payment — deferred at great risk by an executive who had other lucrative options. You’ve now asked the current employees of A.I.G.-F.P. to repay these earnings. As you can imagine, there has been a tremendous amount of serious thought and heated discussion about how we should respond to this breach of trust. So what am I to do? There’s no easy answer. I know that because of hard work I have benefited more than most during the economic boom and have saved enough that my family is unlikely to suffer devastating losses during the current bust. Some might argue that members of my profession have been overpaid, and I wouldn’t disagree. That is why I have decided to donate 100 percent of the effective after-tax proceeds of my retention payment directly to organizations that are helping people who are suffering from the global downturn. This is not a tax-deduction gimmick; I simply believe that I at least deserve to dictate how my earnings are spent, and do not want to see them disappear back into the obscurity of A.I.G.’s or the federal government’s budget. DeSantis is a titan of finance. He writes that the deferred contractual payment he received on March 16 was “$742,006.40, after taxes.” Before taxes, that means he got one of those “million-dollar bonuses.” It’s a lot of money, but it’s certainly not bizarrely high for a senior financial services executive. I think AIG or any troubled company could use more thoughtful and talented executives like DeSantis. The company and the economy need experienced leadership, and yes, financial services leaders make a lot of money. I’d much rather trust DeSantis than any of the politicians calling for his scalp. But the mob has had its say. Best wishes for your future endeavors, Mr. DeSantis. It may be that the full picture was kicked up to [Geithner] only when a political decision was needed, but by then his one decent choice was to insist on the bonuses’ legality. 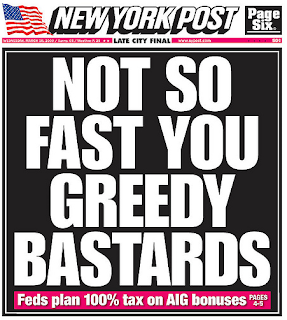 However politically inopportune the bonuses may be, the president only dirtied himself by authorizing a feel-good, bipartisan hate storm aimed at innocent AIG employees. And it’s hard to believe Mr. Obama would have done so, or the subsequent spectacle would have unfolded as it did, without Mr. Geithner’s seminal prevarications (and we say this fully acknowledging that he’s had a rough ride in an inhumanly difficult job). But the biggest lesson here is the old one that the price of freedom is eternal vigilance — beginning with insistence on the rule of law. Americans clearly cannot trust their elected officials to defend their rights and interests, or care whether justice is served, when the slightest political risk might attach to doing so. Which brings us back to Mr. Cuomo, whose office has been implicitly threatening to publish names of AIG employees who don’t relinquish pay they were contractually entitled to.